Leading Manufacturer of assembly of fbc boiler, five pass fbc boiler, bed and nozzle coil for fbc boiler, fluidized bed boiler, fbc boilers and fluid bed combustion boiler from Ahmedabad. With our competitive approach towards quality, we are able to manufacture and supply a huge stock of Assembly of FBC Boiler. This fluidized bed combustion boiler works on the principle of gaseous exertion created by the burning of solid fuels. Our offered boilers are suitable to be used in various industries. This Assembly of FBC Boiler is also quality approved by our team of analysts, who inspect the boiler during the pre & post production procedure, based on several set parameters. We are an eminent firm, which is engaged in offering a Five Pass FBC Boiler. 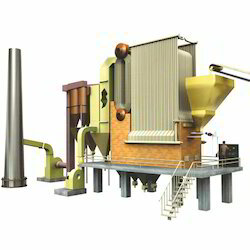 The Boilers has Modern 5-Pass design and FBC Firing system suitable to burn Coal, Lignite, Saw Dust, Husk etc. very efficienctly with minimum unburnt losses. The efficiency as high as 85% is achieved with our FBC Boilers. The Bed Coils are fabricated from SA 210 Gr. 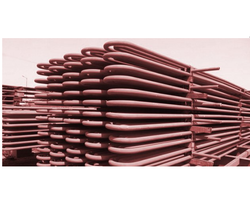 A1 Seamless Tubes. The offered range is manufactured using premium grade raw material and modern machines in strict adherence with the industry laid standards. Offered range is widely appreciated in the market for its performance, durability, superior efficiency and reliability. We are suppliers of Bed and Nozzle Coil For FBC Boiler. 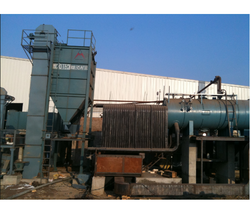 Our customers can avail Fluidized Bed Boiler from us. The offered range of fluidized bed boilers is also termed as a fluidized bed combi-tube twin membrane water wall panel boiler and possesses an efficiency of 87%. This range is highly acclaimed in the market for its twin membrane design and FBC firing with under bed and over bed options. 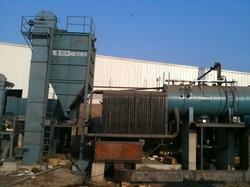 Offered products are ideally utilized for agro waste firing like rice husk, ground nut shell and DE-oiled cake. 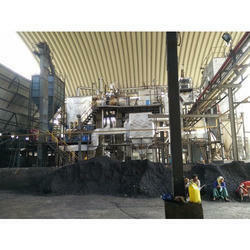 These products are applicable for low calorific fuels like lignite and brown coal. Fluidized bed combi-tube twin membrane water wall panel boiler with very high efficiency upto 87 % on coal. High efficiency due to twin membrane design and fbc firing with under bed and over bed options. 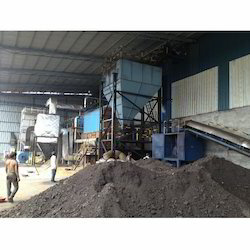 Suitable for agro waste firing like rice husk, ground nut shell, de-oiled cake. Suitable for low calorific fuels like lignite, brown coal. We are an eminent team of highly learned workforce that are engaged in offering FBC Boilers that is precision created with 3 pass design membrane water wall to ensure complete combustion and minimum carry over into smoke tubes and 5 pass boiler to have very high efficiency. Moreover, this is not only compatible with a wide range of fuel such as high grade coal, oil and gas however is compatible with low grade fuels like low grade coal, biomass, waste plastics, sludge and waste tires. Competitive Advantages of the product Twin Membrane Design and 3 Pass Furnace construction to ensure higher efficiency with Mulifuel Firing. Efficiency as high as 85% is achievable. Payment Terms : 100 % against Performa Invoice or LC at sight. We are one of the highly acknowledged units engaged in offering Fluid Bed Combustion Boiler that comes with lower auxiliary power consumption and under bed / over bed fuel feeding options. Furthermore, this is not only compatible with a wide range of fuel such as high grade coal, oil and gas however is compatible with low grade fuels like low grade coal, biomass, waste plastics, sludge and waste tires. This has it varied applications in Edible Oil Refinery industry, paper mill industry, chemical industry, textile industry etc. Our offered Fluidized Bed Boiler is in which fuels are burned in suspension of hot bed material consisting of sand, ash and additive. The hot sand effectively dries and ignites challenging fuels with near to the ground heating value or high ash content and various combinations of them. Powerful turbulence and superior mixing results in high combustion effectiveness and squat emissions. This is compatible with extensive range of fuels such as high grade coal, oil and gas. We are instrumental in manufacturing and supplying a high quality array of Fluid Bed Combustion Boiler. The offered array of boiler is available with membrane water wall cooled furnace, which ensures its simplified, cost-effective and efficient design along with enhanced performance. These are engineered from top quality components and danced technology as per the defined industry standards. Depending on the higher water circulation boiler design, the offered range utilizes a patented "water wall design" for higher water recirculation. 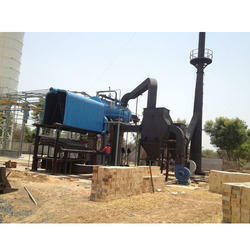 This array of Fluid Bed Combustion Boiler can be availed by clients at market leading prices. With our competitive approach towards quality, we are able to manufacture and supply a huge stock of FBC Boiler. This fluidized bed combustion boiler works on the principle of gaseous exertion created by the burning of solid fuels. 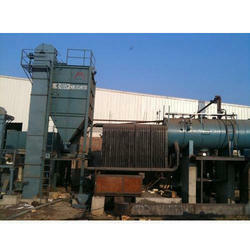 Our offered boilers are suitable to be used in various industries. This FBC Boileris also quality approved by our team of analysts, who inspect the boiler during the pre & post production procedure, based on several set parameters. We are instrumental in manufacturing and supplying a high quality array of TPH FBC Boiler with Bag Filter. The offered array of boiler is available with membrane water wall cooled furnace, which ensures its simplified, cost-effective and efficient design along with enhanced performance. We are the manufacturer and exporter of Fluidized Bed Combustion Boiler.Our customers can avail Fluidized Bed Combustion Boiler from us. The offered range of Fluidized Bed Combustion Boiler is also termed as a fluidized bed combi-tube twin membrane water wall panel boiler and possesses an efficiency of 87%. This range is highly acclaimed in the market for its twin membrane design and FBC firing with under bed and over bed options. 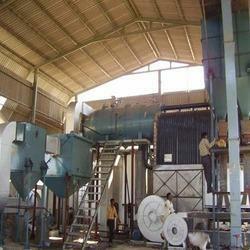 Offered products are ideally utilized for agro waste firing like rice husk, ground nut shell and DE-oiled cake. These products are applicable for low calorific fuels like lignite and brown coal.